Plan an extended vacation to try out your dream retirement destination before making a commitment. Your family and friends can be great resources for recommending restaurants, contractors, vacation spots, and - yes, even retirement destinations. Reach out through social media to talk to loved ones in other areas. Ask what other people love about where they live, as well as what they could do without. Their insights may help you narrow down your own wishlist. While you may dream of coastal living, mountain vistas or desert scenery, visiting a destination can be very different than seeing it in pictures or movies. Plan an extended vacation to see your dream area for yourself. Be sure to go beyond the tourist attractions while you're there. Try to seek out local hangouts and talk to people who live there. Ideally, visit more than once and at different times of the year. Relocating may mean getting used to an entirely different climate, even in the off-season. Take some time to find out what the weather is generally like year round. What are the typical seasons? Is there a dry season or a rainy season? Is the area prone to hurricanes, tornadoes or other extreme weather? Some areas are simply more expensive than others. When researching possible retirement destinations, go beyond home prices to estimate what it will cost to actually live in the area. You can use online tools, such as Sperling's Best Places' cost-of-living comparison calculator. In addition to home prices and cost-of-living, you'll want to estimate your total tax burden in any area you are considering. This means researching local laws for items such as state income tax, sales tax and property tax. Fortunately, you can compare taxes across the country with Kiplinger's state-by-state guide. The best way to learn about an area's current market is to talk to a local real estate agent. Realtors can tell you more about their local area, help you find neighborhoods that meet your needs and answer any questions you may have. If you are considering communities listed on 55Places.com, look in the upper right corner of any community page to find a local real estate agent. While there's something to be said for diversity, settling in an area with like-minded people may help you have a happier retirement. Find out more about the politics and social atmosphere of any destination you are considering. Look for information on message boards, such as City-Data.com, or try to talk to locals while you are visiting the area. New health issues may come up during your retirement years. Check out the medical facilities in an area, including hospitals, urgent care centers and doctors' offices. Also, talk to your insurance to see where it will be accepted after you relocate. 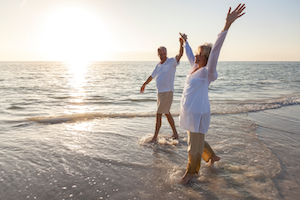 When you begin narrowing down your retirement destination, think about the kind of amenities you want to have nearby. Are you dreaming of country-club living, with access to golf courses, swimming pools, fitness centers and other resort-style amenities? What shops, restaurants and other businesses are available in the surrounding area? Relocating to a dream setting is tempting during retirement, but don't forget to consider how it will affect the things you love. How far will you be from your family and friends? Will you be able to continue your favorite hobbies or recreational activities in a new area? How will a move affect any plans you might have to travel or try something new? Choosing a retirement destination is a big decision, but careful planning can help you find the best place to spend your retirement years.